Beautiful, keep up the good work. How close are you to a basic release, if you are able to say? Sorry, I should have included who made those, I don't have the time to make my own models since I have school, plus it feels pointless since they won't ever be used. But whenever I feel the urge to make any I check this guy out: https://redpanda7.deviantart.com/ He makes some really nice models, and I figured you could get some inspiration as well. BuilderDan1 posted a message on Textures for your Mod! Thanks for the reply and the nice video! The clarification was needed, I'm looking forward to using this mod eventually. I love all of your textures and models and I think it'll be a wonderful addition to the modded community. I think it's wonderful that you're going to be adding more life to the game, and you truly are very creative, so keep up the great work! It's been a while since this has got any attention. Some question I have are, when you hope to release the official 1.0 version, will it be 1.12.2? And Will it include a majority of the mobs you have listed above in this forum? I'd also like to suggest being able to tame literally every mob you create, why you may ask? Well why not, people love having pets and companions, plus it'd be another added use for the mobs. Whales could act like boats, what about adding more aquatic mobs like dolphins, starfish, giant squids (With better flowing models than vanilla squids), maybe even a Kraken boss (This was something people wanted a while back in the update that added monuments if I remember correctly...), maybe even add some of your own ocean mobs, possibly a serpent. You could also add crabs and crab related armor. Before I keep going I'd also like to question whether you intend to support Biome's O' Plenty. Having your mobs coexist within the unique BOP biomes would really add to the game. I wouldn't bother making birds since the Exotic Birds mod is soon to be updated and is excellent: https://minecraft.curseforge.com/projects/exotic-birds?gameCategorySlug=mc-mods&amp;projectID=242830, but you can still make your own of course if you desire. I think it'd be great if you and Pavocado worked together to create a beautiful animal mod. Regardless, back to mob ideas: Rhinos would be interesting, using their tusks to make horns which in turn would help you control them when tamed, Monkeys would be another great addition, adding the possibility for banana's (Hopefully support with Pam's harvest which has bananas) Cheetah's and Panther's would be great too. A Gigantopithecus boss in the jungles would be amazing as well (I'm thinking of the scene from the newest jungle book movie, the Gigantopithecus), this would also be an excuse to add orangutans. Getting into some mystical mobs: I think a medium sized white stag would be amazing, kind of like the one from the film Snow White and the Huntsman. I would love to see some form of mud creature, possibly even a mud/swamp boss with tentacles and a gaping mouth. 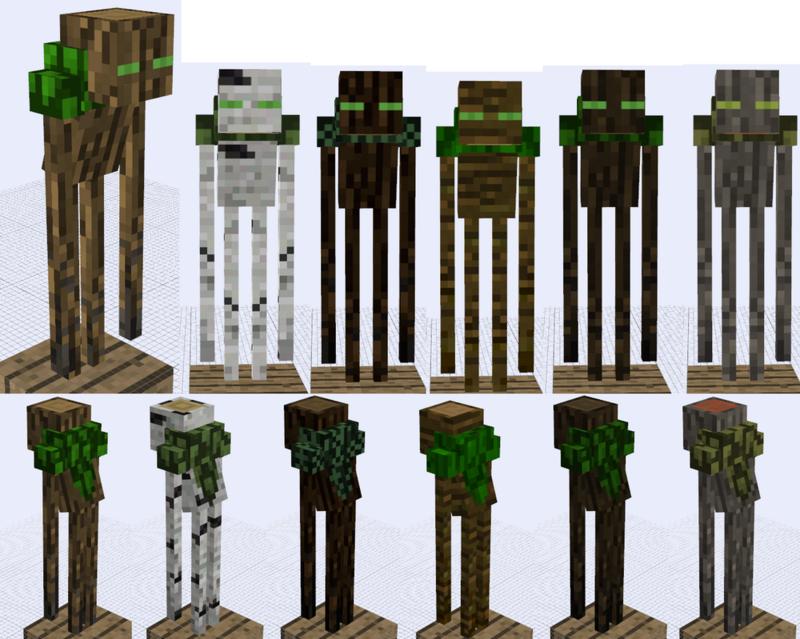 Adding brute types hostile mobs would be interesting as well, having them hunched over and a bit larger than the vanilla hostiles. Ice biomes are rather lacking and I think penguins would be a wonderful addition, possibly even walruses. Giant ice worms would be an interesting concept as well, possibly a boss idea. Butterflies of all kinds would be good to see, alongside butterfly jars and maybe even a book to document the ones you catch, obviously a net as well. I forgot to mention but jellyfish would be a great addition too, possibly even a mother jellyfish as a boss. Scarabs could be added to deserts too, blue-shelled beetles, (beetle Sheilds and Armor). Pigmen villages and villagers would be nice to see as well. Anyways, I could keep going on and on, but this post is large enough. Hope these ideas are helpful in some way, I'd love to talk more / work with you if you want to hear even more ideas.